I made a lot of these Robin’s Nest Cookies for a Senior Citizen’s Spring Tea I was helping out with and they were a big hit. 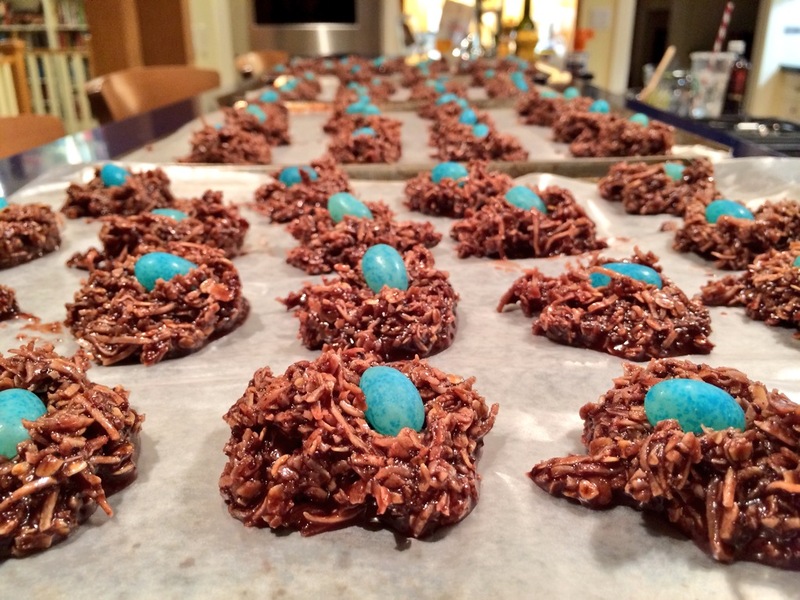 Just make your favourite chocolate macaroon recipe and poke a little robin’s egg blue jelly bean on the top of each. I’m not usually very Martha Stewart but, yes, I have to admit that I did stand at the bulk bin and pick out all the jelly beans that were this pretty blue colour. My macaroon recipe follows in case you don’t have one of your own. 3 cups quick-cooking rolled oats OR 1 1/2 cups oats and 1 1/2 cups crushed shredded wheat Tip: looks more like a nest with the shredded wheat. Sift the cocoa into a bowl and stir in the sugar to evenly distribute it. Put the milk and butter in a saucepan on medium heat and cook until the butter melts. Whisk in the cocoa mixture, increase the heat to medium-high, boil for 5 minutes and remove from heat. Stir in the vanilla, coconut and oats and mix well. Drop by the tablespoon full onto the waiting baking sheets and press a Robin’s egg blue jellybean into the center of each cookie. Refrigerate at least one hour and then transfer to an airtight container and keep refrigerated. Merci Karen . They sure look good and delicious . Thanks for the note. You are kindness itself.